1,000 pound weight capacity per shelf! Keep product organized and off the floor while providing adequate air flow with the 2-1/4â wide Tâs which are spaced 1-3/4â apart. Each unit is designed to hold heavy loads and has easy-to-clean flat surfaces. 3 shelf units have 22-1/2â shelf clearance and 4 shelf units have 18-1/2â shelf clearance. Stationary units come equipped with adjustable feet. 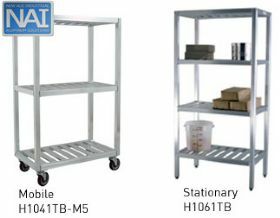 Mobile units available in 5â platform casters (-M5)or 6â platform casters (-M6). FOB Shipping Point. Optional 5" Casters add suffix - M5. Add $153.40to price. Optional 6" Casters add suffix - M6. Add $204.75to price. D x W x H Wt. (lbs.) Price Ea.